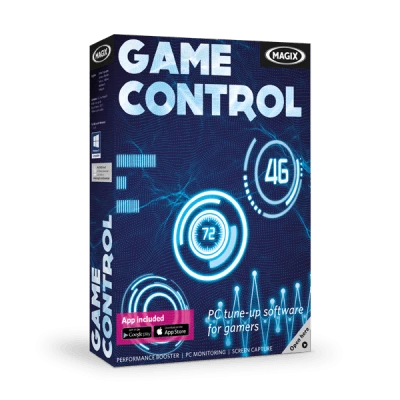 MAGIX Game Control is the ultimate tool for successful gamers. It provides you with everything you need to maximize your gaming experience, from performance benchmarking and monitoring to performance boosting and screen capture tools. Increase your computer's speed and keep track of important performance indicators in view on the HUD or the innovative second screen app for your smartphone or tablet. Monitor all the relevant system information live on the HUD or app: FPS, RAM, CPU, temperature, disk space & network load. Give your game the highest priority. Optimize your computer's energy options and end unnecessary tasks and processes for pure gaming enjoyment. Take in-game screenshots or record videos and share with friends on Facebook, YouTube or wherever you want. Bring your computer back up to speed at the press of a button. This games booster optimizes your computer's energy options, ends unnecessary processes and gives your game the highest priority. For gaming at its best – fast, smooth and visually appealing. Take in-game screenshots or record videos. Record gameplay on your PC or directly from the app. Hardware encoding* reduces CPU load so you can record in full resolution in MPEG-4 format. The ultimate performance check for processor, graphics card, hard drive and memory. Compare your PC performance with other Game Control users. Share moments with your community on Facebook, YouTube or wherever you want. All screenshots are added directly to your smartphone or tablet. All your games, screenshots and gameplay videos are saved in galleries where you can organize them and share them with friends. Keep your system up to date to get the most performance out of your hardware components. Control all system data relevant for your game in realtime – direct in game on the HUD, in the program or in the second screen app. Game Control is sold as a 1-Year license version. Renewal for a special price.